David has managed more than 1.25 million square feet of office, retail and warehouse space, and more than 20,000 multi-family apartments in the Southeast and Midwest regions of the United States. A graduate of Wichita State University with emphasis in real estate and urban economics. He is the Director of Commercial Management at Weigand-Omega Management. He has been a licensed real estate broker in Kansas since 1979. He holds a Paralegal certificate from Hutchinson Community College.He has participated in a variety of roles in the acquisition and sales of commercial properties throughout the United States. David has served multiple times President of the Wichita Chapter of the Institute of Real Estate Management (IREM). He holds the prestigious Certified Property Manager designation CPM® from the Institute of Real Estate Management and the Real Property Administrator RPA® designation from the Builders Owners and Managers Institute (BOMI). He has served as President of the Wichita Kansas Chapter of the Building Owners and Managers Association and is currently serving on the board of directors. He has served as a Regional Vice President for two regions of the National Apartment Association. He was a co-founder and Past President of the Apartment Association of Greater Wichita. He is a graduate Leadership Wichita. 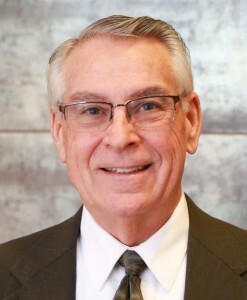 He is also a charter inductee in the Wichita Apartment Industry Hall of Fame.David is an adjunct professor and faculty member of the Wichita State University Center for Real Estate at Wichita State University Frank Barton School of Business. He is married to Jo Lynn and has four grown children. When not pursuing his passion for Real Estate he collects classic cars, and enjoys upland bird hunting.